(First visited on May 20th 2011. 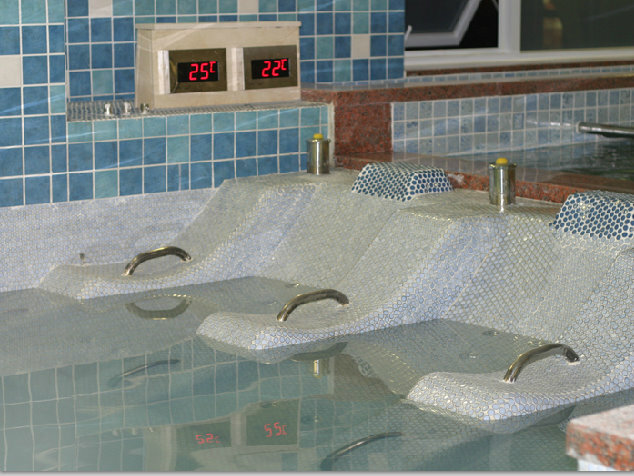 Last visited on 15th September 2012) You know a bathhouse can be designated ‘luxury’ when you visit on consecutive days, even when you are impeccably clean, and during your stay spend substantially more time in the pools and saunas than engaged in ablutive processes. 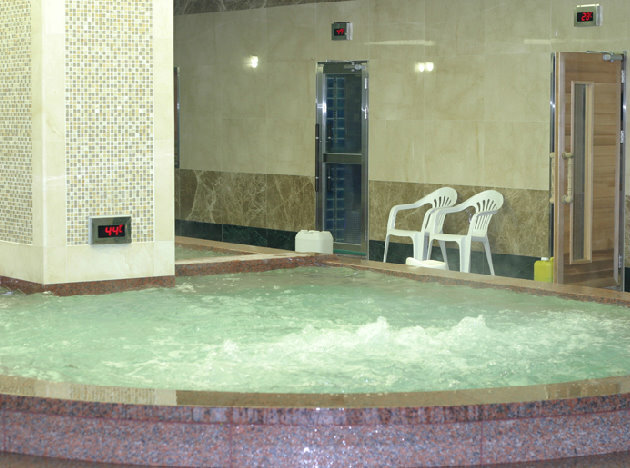 It’s my opinion, but currently, I consider Wonderful Spaland, Wol-Seong-Dong, as one of the best bathhouses in Daegu, and certainly what I would rank as a’ luxury bathhouse’ where one goes to relax, spend time with friends and do more than simply get clean. It’s failing are few and trivial. 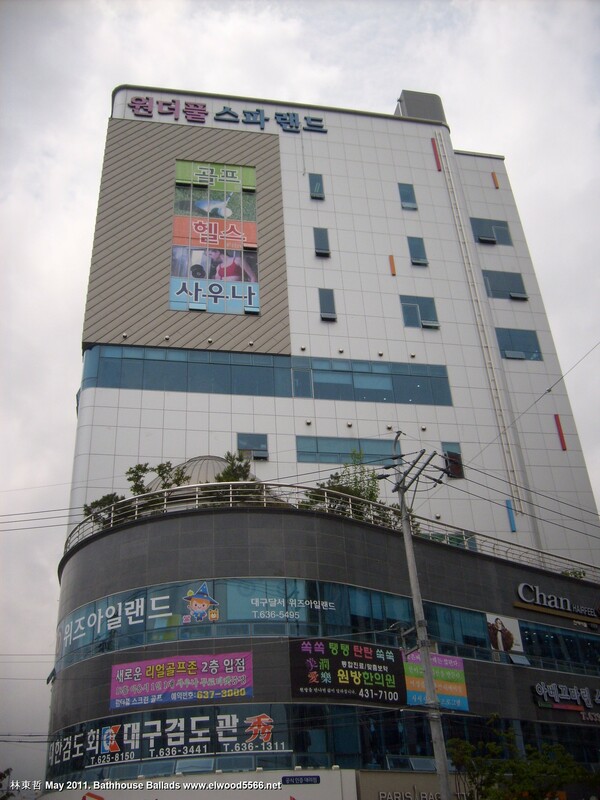 First, it isn’t a 24 hour establishment and second, it has no jjimjilbang. I can live with that! However, it does have several floors dedicated to golf, a large fitness center and besides being impeccably clean, is fairly new. I often joke about how bathhouse ‘event pools’ are event-less. Personally, pretty coloured water, even with a few bubbles gurgled through it, doesn’t constitute much of an event. And so often, the added aromas are scent-free. In Wonderful Spaland you can expect a surprise and on my last visit the scent of one pool lingered on my skin for a few days. The Wonderful complex is slightly on the edge of the built up area of Wol-Seong-Dong and noticeable by the green golfing nets on its roof. A large foyer on the ground floor, next to a Paris Baguette, welcomes visitors. The changing area (male) is bright and very spacious with decent size lockers, barbers and shoe shine. This is probably one of the largest bathhouses I’ve been to and there are plenty of areas to enjoy. The event pool was a ruby-red brew of intense red ginseng opposite which was ‘milky bubble bath’ with beautifully silky soft water. The bath really does look like a vat of milk. Other pools included hot (열), warm (온) and a second event pool, which on various visits has included lavender and mugwort additives. 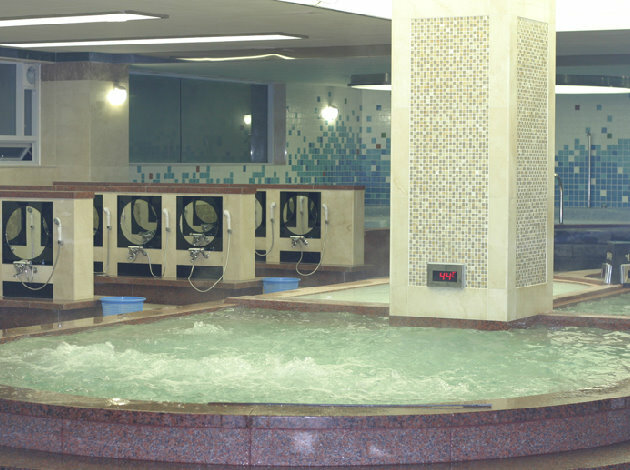 The largest pool (안마) comprises about 25 massage facilities with 6 different types of massage. Next is the cold pool (냉), significantly colder than many other establishments and very bracing. In another corner is a partitioned area where slatted wooden panels provide privacy so that large sliding doors can be opened reducing the temperature to that of the outside. Though not strictly a no-ch’eon (노천), which is usually fully outside, this is what it is often called. 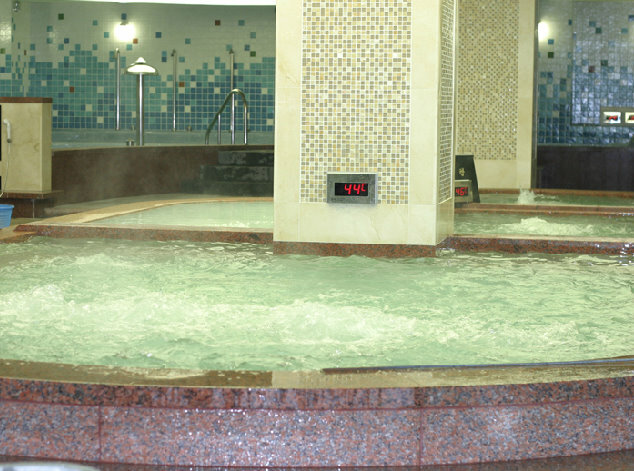 Nearby is a salt sauna (소금 사우나), small sleeping area and a fantastically intense oak charcoal bath (짬나무 / 목초탕). Alongside the pools are 4 large saunas: a three leveled yellow mud sleeping sauna (황토), a steam sauna (안개) and a pine sauna (핀란드). 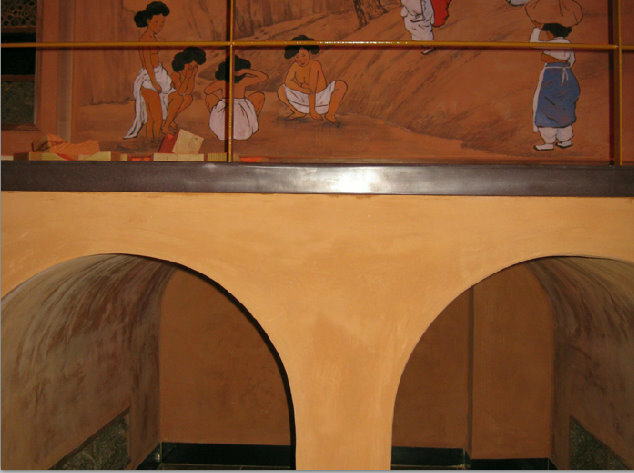 However, the most enjoyable was the Roman sauna (로만 사우나), a large circular room with a conical ceiling. The entire room, a large mosaic at the center of which is a boxed-in steam vent. The entire room and conical ceiling where either covered in mosaic or various ‘jewels.’ However, the crowning feature was the heady scent of cinnamon and what might possibly have been aniseed. The humid aroma, blasted intermittently out of the large steam chamber seemed to shift and shade between the two key notes with spells when they seemed to blend equally. I have to say, I have a sensitive nose and there was something almost ‘trippy’ in the Wonderful Spa Land olfactory experience so much so that I feel disappointed by its absence in other bathhouses. 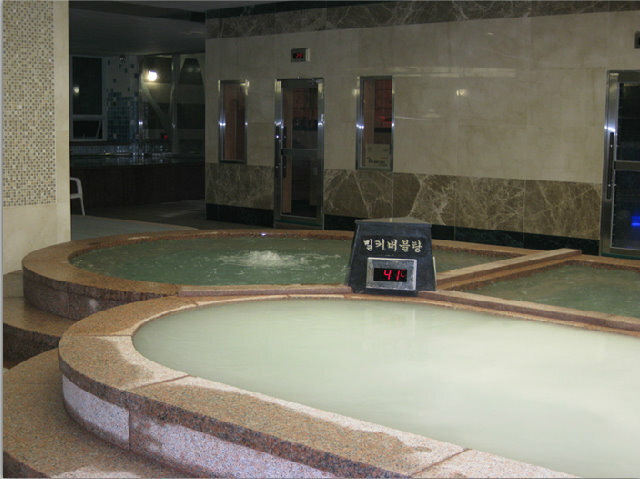 If you’re only going to visit one bathhouse during your stay in Daegu, this is at the top of my recommendations and while you body relaxes, you can guarantee your nose will be subject to a comprehensive and pleasurable workout. Location – Daegu, Wol-Seong-Dong (Wikimapia link ) near Wolbae Subway. 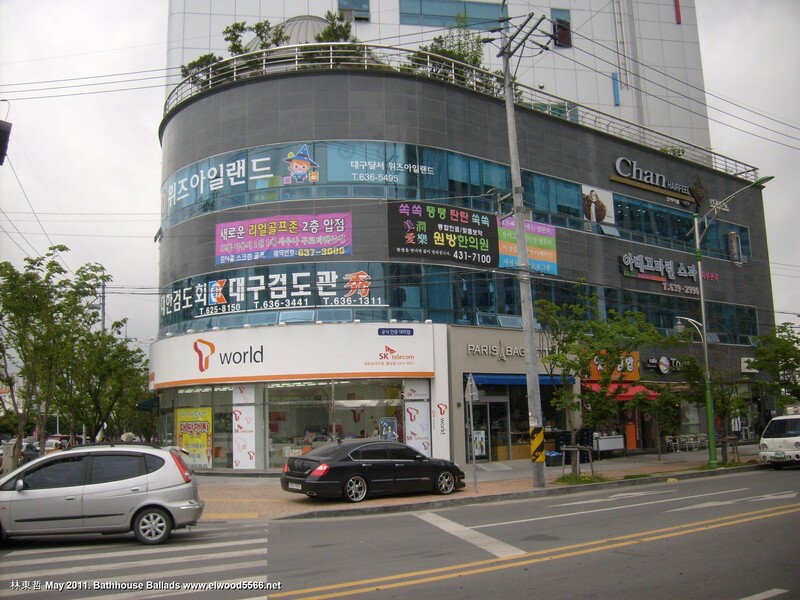 It is within easy walking distance of Wolbae subway and by taxi from Lotte Cinema in Song-so, it is 5000 Won. A taxi from Wolbae subway will be little more than 2500 Won. It is also on the route of the 655 bus (Daegu Metropolitan City Bus Guide). (The brochure above has a small map). Facilities – car parking, screen golf, golf driving area, fitness training, first floor Paris Baguette, coffee shop, small restaurant. Others – hairdressers, shoe shine, massage and rub downs, various seasonal discounts, numerous televisions. About a five minute walk from the ‘meat fest’ barbecued buffet restaurant, Gong-Ryong (공룡 – ‘Dinosaur.). Thank you so much for posting this! I was trying to find a place to go in Daegu and I just came back from wonderful spaland. and let me tell you, it is wonderful!!!!! I was on the “womans” side and it is very similar to what you described in the mens side. It was easy to get to (driving) and will be going back. I loved the sented saunas. i really like the salt room as well. heck, I liked them all. Thanks again for posting! otherwise, I would not have been able to go to one without knowing what to expect! Angela, I’m so glad you found it as exhilarating as I did. It is certainly the best bathhouse I have been to. Next you should maybe try Saeng Hwal – which I have to post about or Migwang or Goong Cheon Lavender. Keep me posted. Just went today with two friends. It was badass! So far my favorite has been Lavender, but Wonderful Spa Land may have just taken first place. Thanks for the blog, it’s so helpful! Glad you enjoyed it! Thanks for visiting.